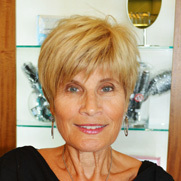 Born and raised in Italy, Giovanna has an established, twenty-year career in the beauty industry. She travels in America and abroad to obtain advanced education in cutting edge techniques and color. Giovanna is committed to great client dialogue and believes it is paramount to providing superior service. She particularly enjoys teaching her customers different ways to style their hair between salon visits.